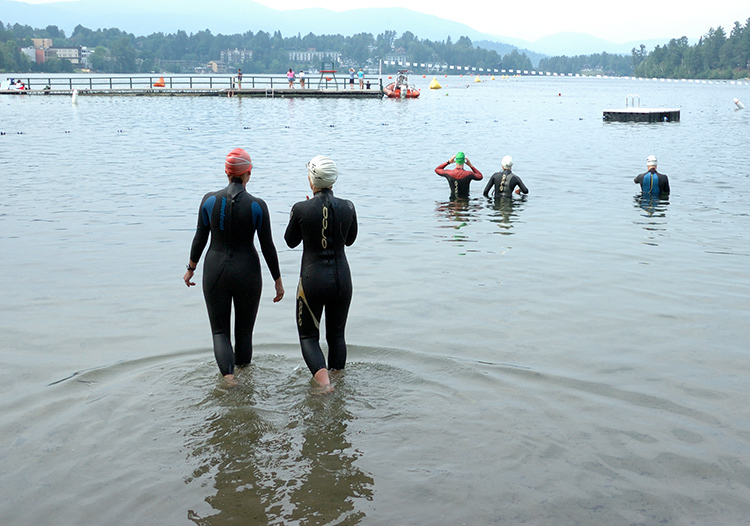 Marian and Cathy Bodnoff prepare for a swim on the Ironman Course, in Lake Placid's Mirror Lake. 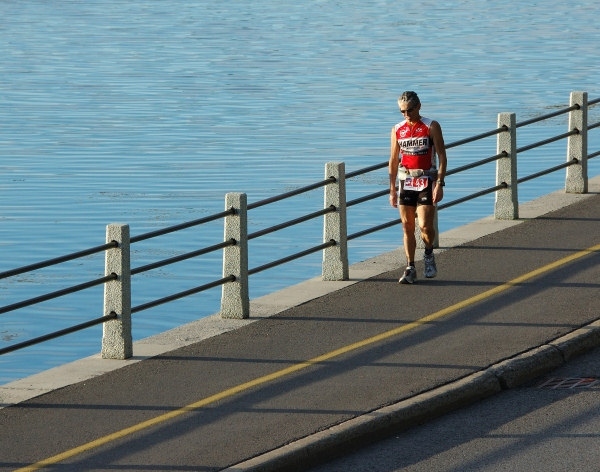 On the Friday before the event, Ironman Canada competitors get their feet wet, so to speak. 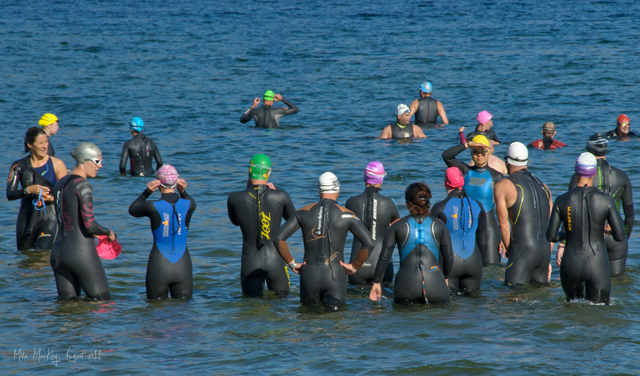 With their wet-suited triathlon friends they will do easy swims, to keep limber and get the feel of the swim site. 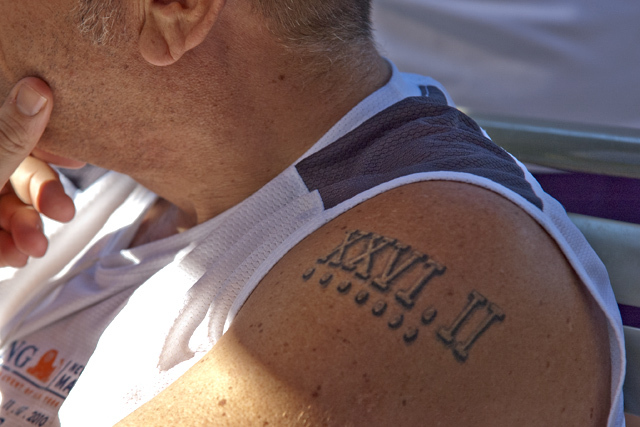 A competitor from Memphis is body-marked before sunrise. In the background is Lake Placid's town hall. 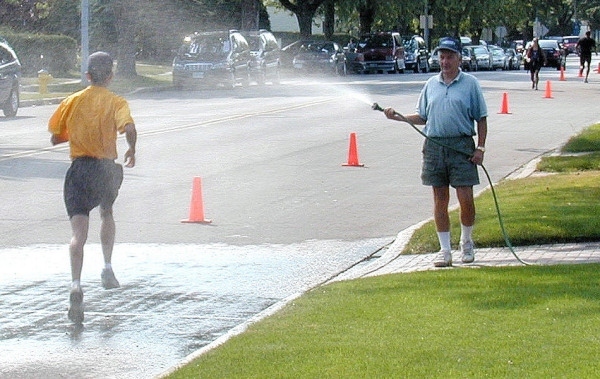 A few minutes before the start, two volunteers give the beach a final housekeeping. It is cool, as you can tell by the clothing. Fortunately the previous day's killer wind has subsided. At precisely 7:00 a.m. the sun came over the hills and gave this wonderful backlighting to the start splash. 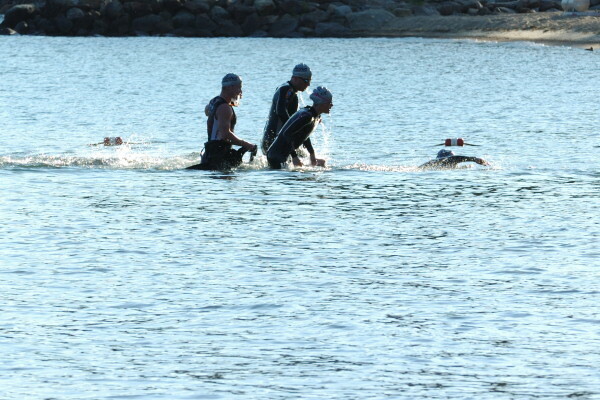 I may never get a better shot of a swim start. 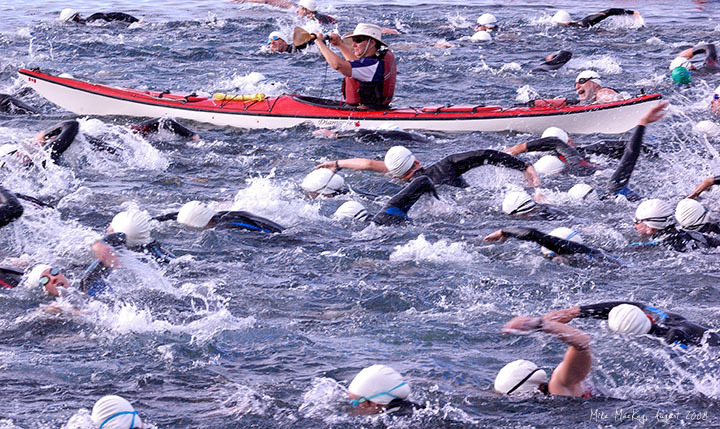 The first event of the triathlon is the swim. 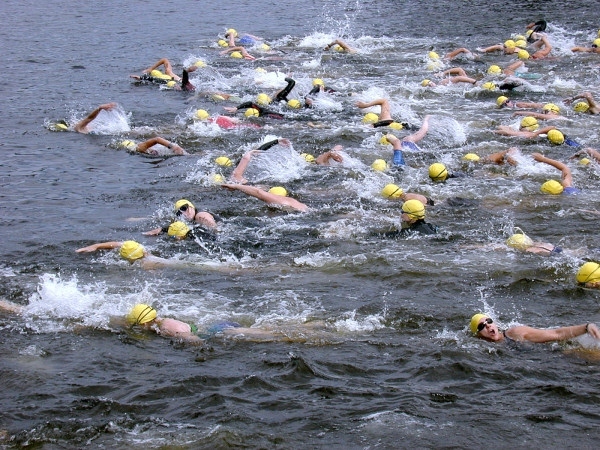 Here, at Carleton Place, the Women's start shows intensity without all of the pandemonium that can accompany a swim start. 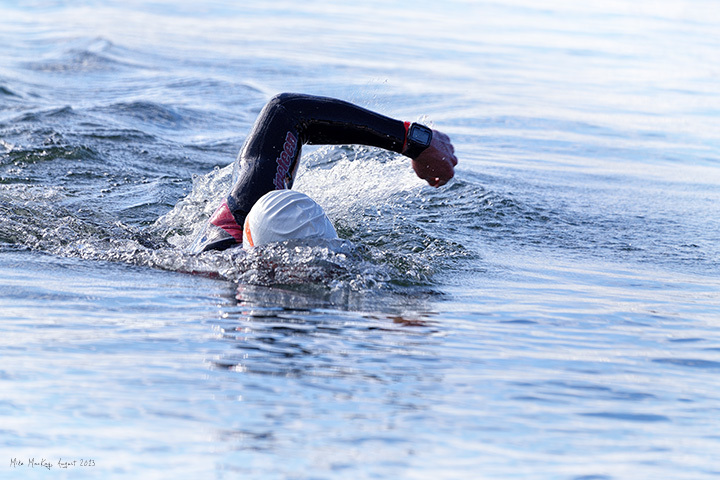 At the end of the swim it's a new battle. Do you try to swim the shallows or try to run? 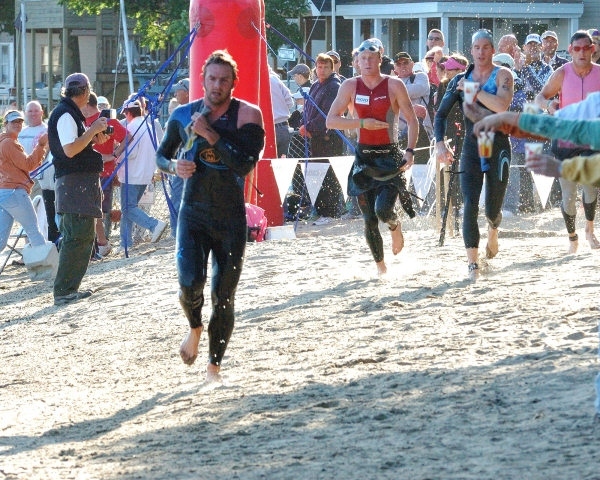 Bjorn Andersson, who finished second overall, leads the Pro group out of the water into the first transition of the Timberman Half-Iron. Spencer Smith's pink clothing is visible to right. Notice the water droplets. A bit like a water-soaked Golden Retriever. 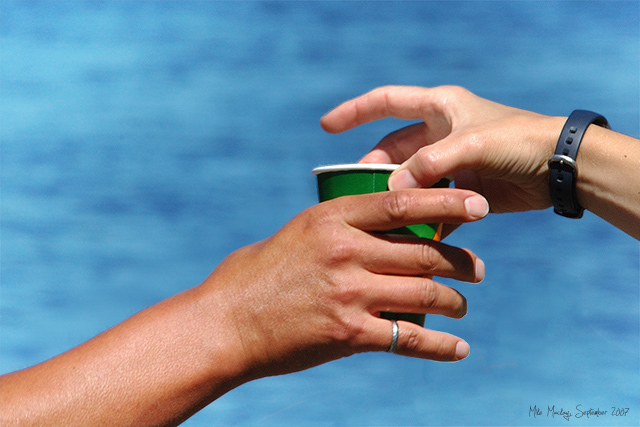 I continue my search for the ultimate cup shot. 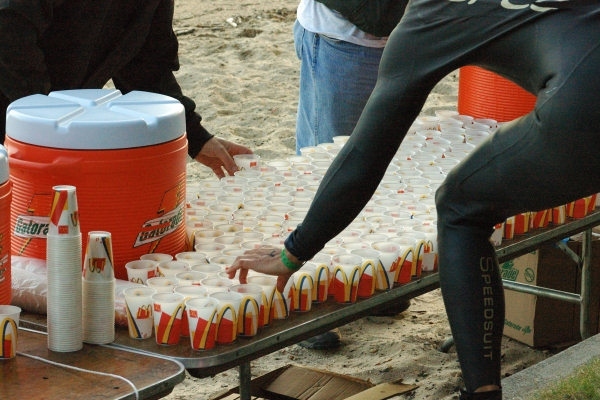 Most events don't have an aid table as part of the swim, so this is unusual. Warming up for the Good Life Time Trial on a very foggy morning. 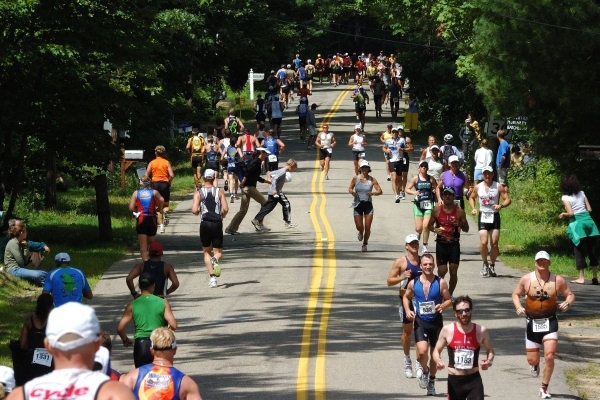 Hill workouts can be breath-taking! 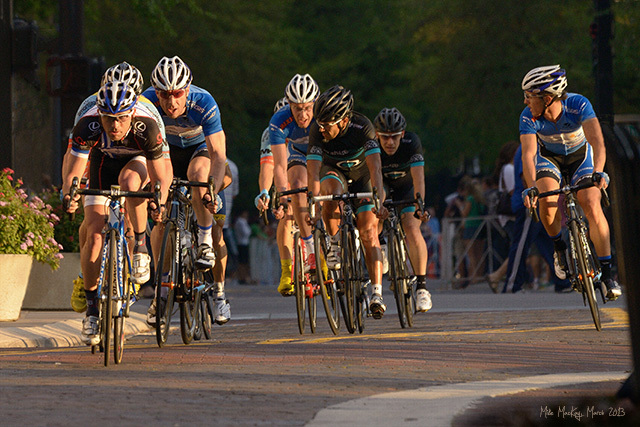 Lead group of riders in the Cigar City Criterium professional championship. 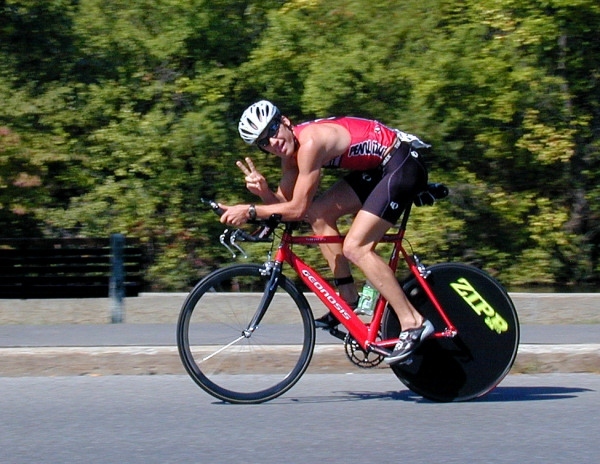 Charles Perrault returning on one of the half-dozen loops of the Canadian Half Marathon, September 2004. He won the event. 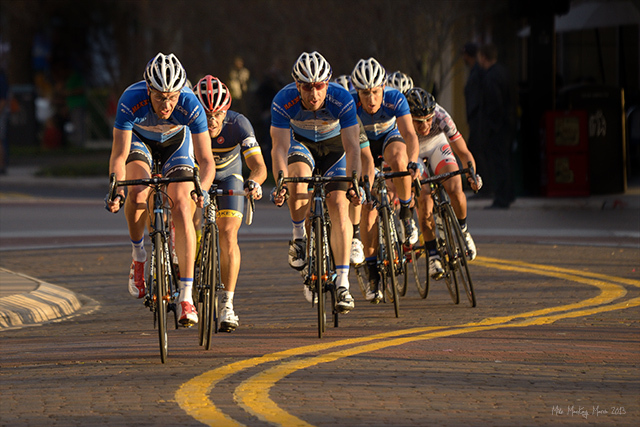 When we first arrived, there wasn't any action on the run, so I had some time to shoot passing cyclists. 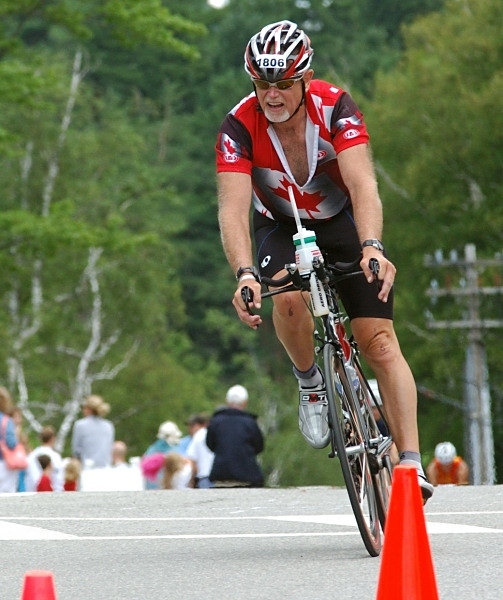 Here is Randy Roffey on one of the twelve loops of the iron-distance bike. I think that must be duct tape. No doubt to reduce turbulence and make the helmet more aerodynamic. 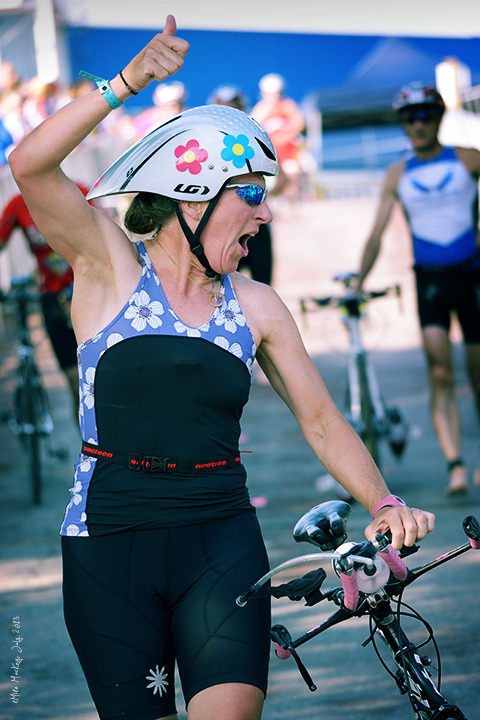 Brenda Oatway comes off Mirror Drive onto Parkside Drive, just about at the end of the first bike loop at Ironman Lake Placid. This seems to be a very successful pan-shot. All details are blurred except for key areas of the subject. 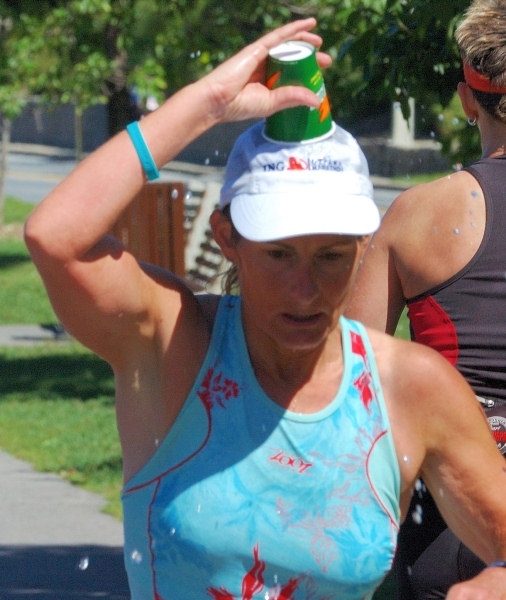 Brenda Smith, Marblehead, Massachusetts, about halfway along the bike route in Ironman Canada 2011. Kory McDonald and Lisa Meyer sprint to the finish of the Ottawa Bicycle Club Women's Time Trial Final. 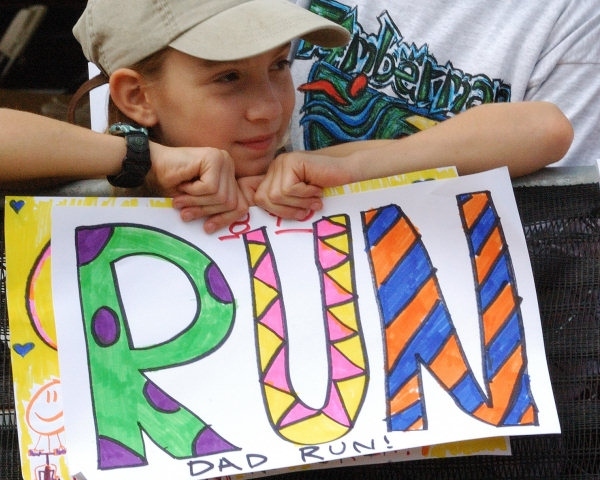 DSC_12054 - Run Dad! Run! 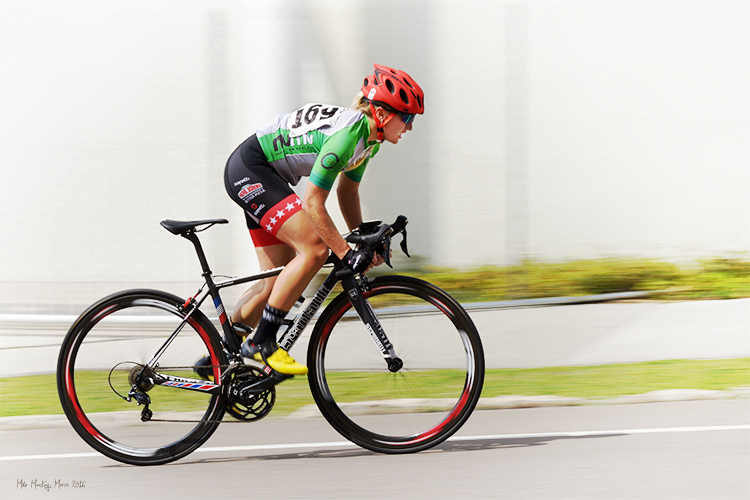 Because of the slight downhill as you approach the corner of Lake Placid Club Drive and Parkside Drive you can develop a little bit of speed. Will Ronco, in the Pro group, finishes the ride. 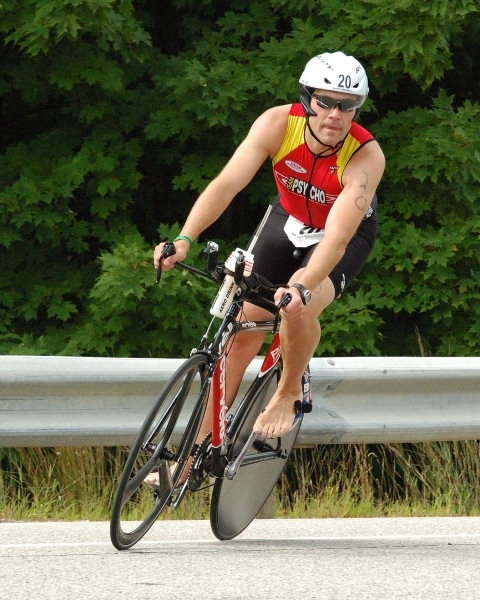 At this point, with about a hundred yards to dismount, he is out of his left shoe. 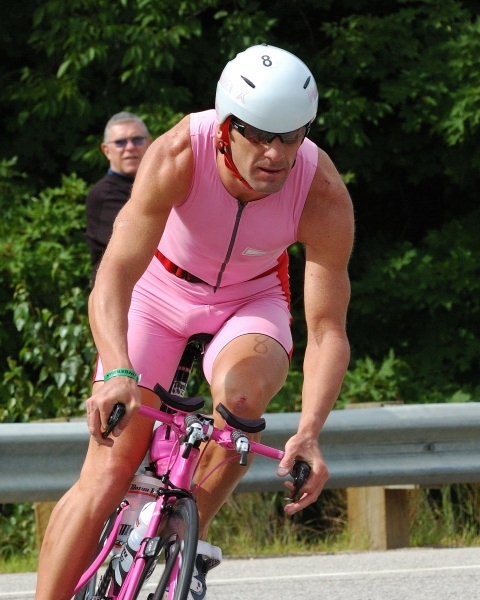 Spencer Smith's pink gear got lots of attention. 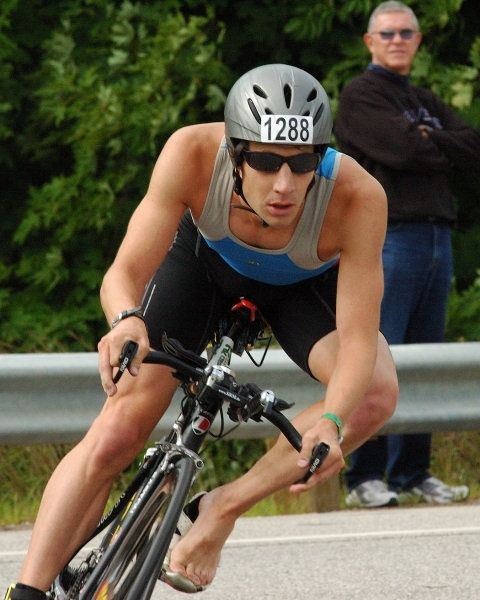 Spencer is a British Pro who has won several major events, including the 1993 and 1994 ITU World Triathlon Championships. The clothing thing is serious with him. According to the TriTalk.uk web site, he is currently working with a designer in Italy on the release of his own line of clothing. One of the amazing things is how competition can turn a pink-trimmed, flower-bedecked little woman into a fighting machine. There is no such thing as a self-made man. You will reach your goals only with the help of others. I was peering through the viewfinder, looking for good shots. 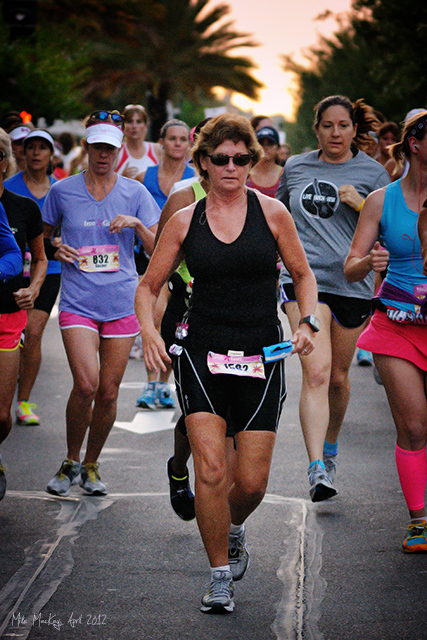 It wasn't simply a pretty runner that caught my eye, but the flash of backlit blonde hair. 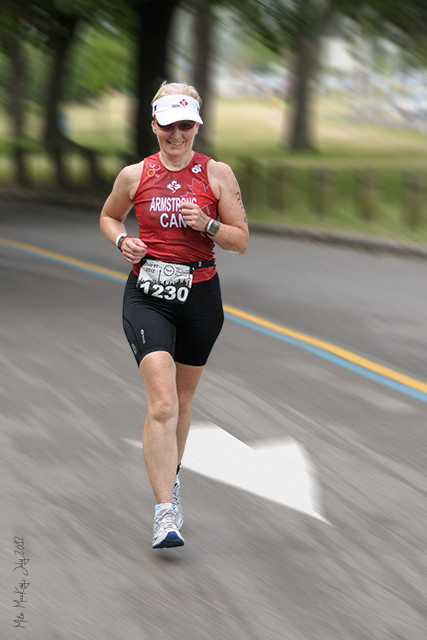 It's really unusual to see a runner run with loose hair. Usually it's a pony-tail and almost always a hat. And I love the young fan. 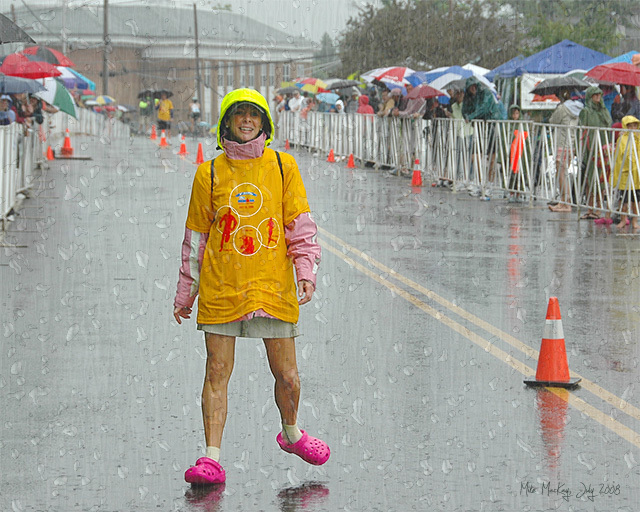 This volunteer was controlling pedestrian traffic across the run path. There is a picture of her sweeping the beach at seven in the morning and I know she was busy on Friday and Saturday as well. 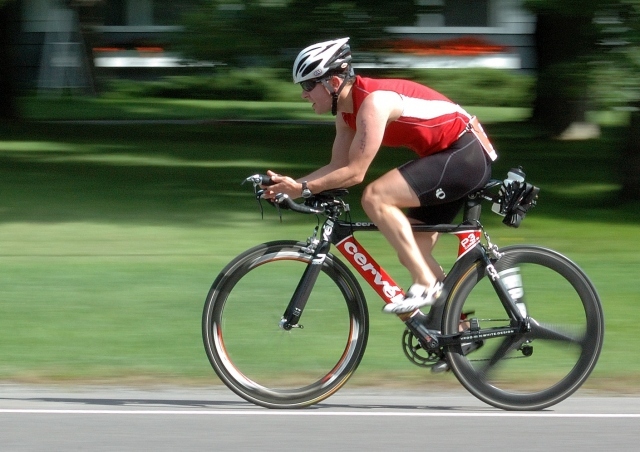 The number is worn on the back during the bike, and on the front during the run. ...Oops! Notice the gel packs in the left hand. Nutrition. It was quite a surprise to see the run. I hadn't expected this level of congestion. As can be seen, crossing the road could be difficult. The run is a two loop run, and some of those people are on their second loop. DSC_12216 - Team "Splash, Spin, Sprint"
In the Half-Iron team event, this is Louise Hamelin of the "Splash, Spin, Sprint" team. 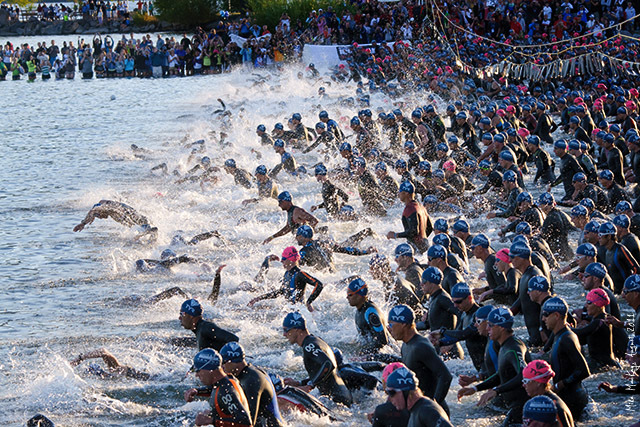 I wonder if the "Splash" refers to the swim or the run. The Coke rises to meet Dev Paul. Dev was competing in the Half. Bryan Palas shot at Fort DeSoto just after sunset. 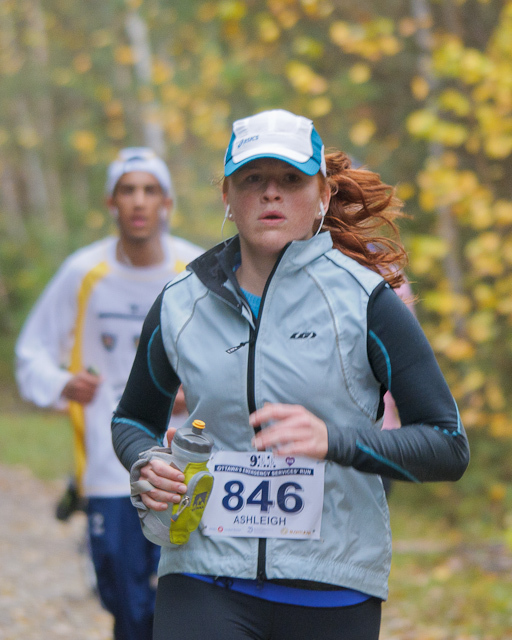 Katie McClean finishes the 2011 9RunRun first in her age group and fourth overall. 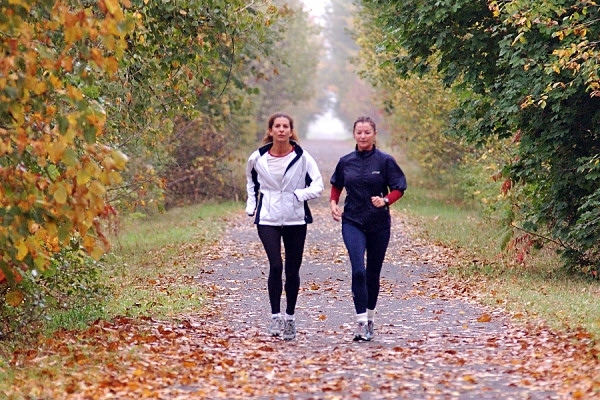 There are several reason why one might choose to run indoors. 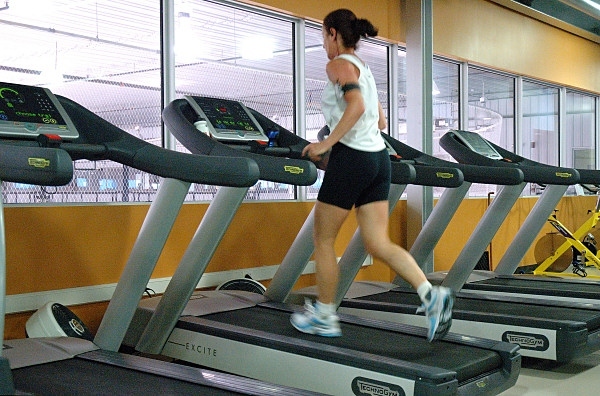 The treadmill gives precise control over conditions, including grade and speed, and gives great protection from sleet and and snow. 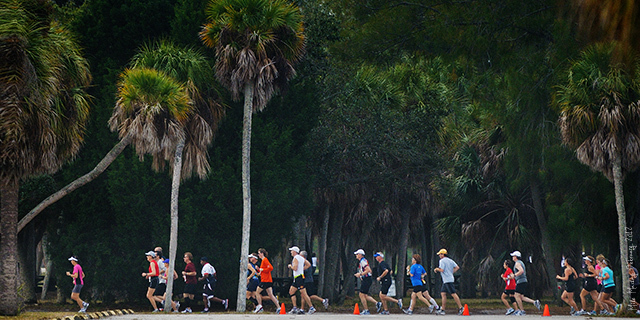 The runners seed themselves at the start of a run. 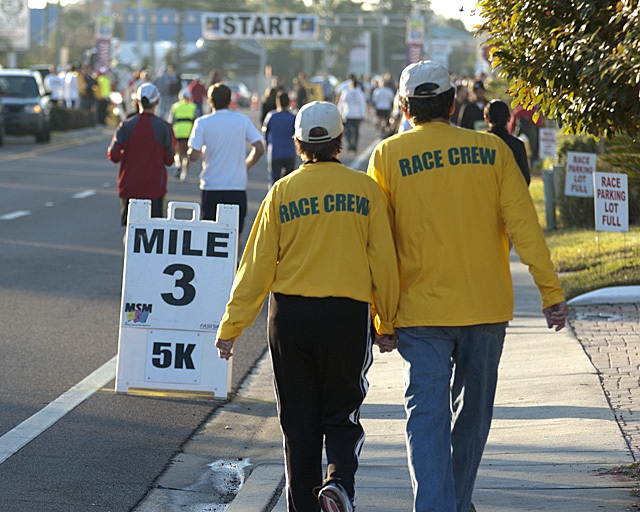 The faster runners are at the front and the slower or less competitive runners keep back so that they won't be in the way of their more serious competitors. 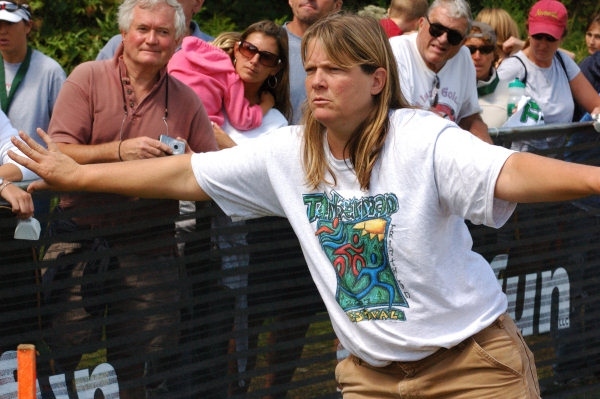 Here, the runners prepare themselves for the first action of the event, pushing the start button of their stop watches when the gun goes off. The fellow on the left may not totally grasp the seriousness of the moment. 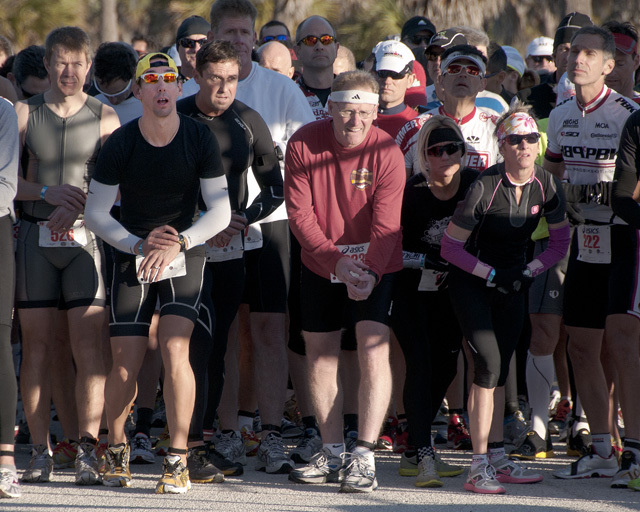 The Over-39 wave ready for the start of the 2011 Chilly Willy Duathlon. 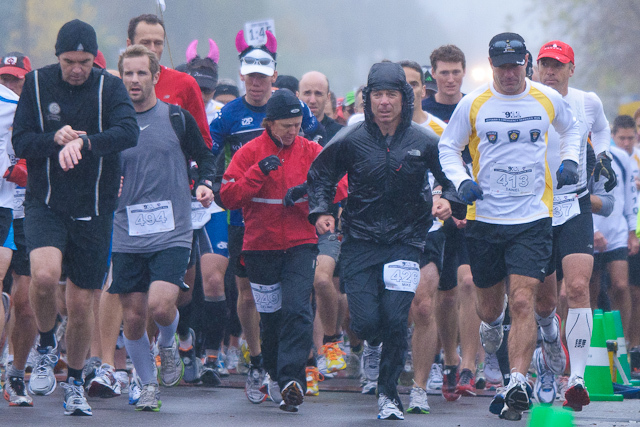 Ottawa's 9RunRun Half-Marathon start takes place in a one of those fine, foggy Autumn drizzles. 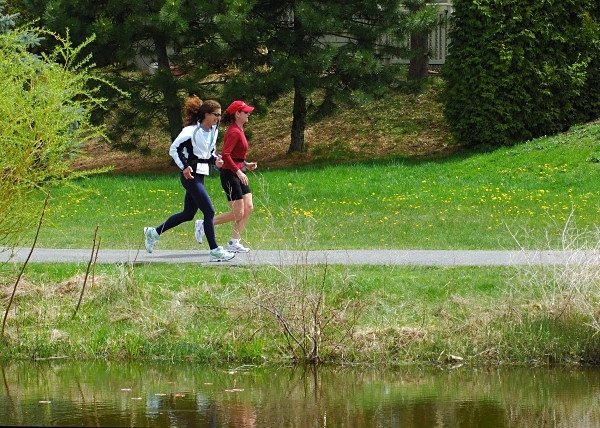 The race is run in support of the Ottawa Police Services. 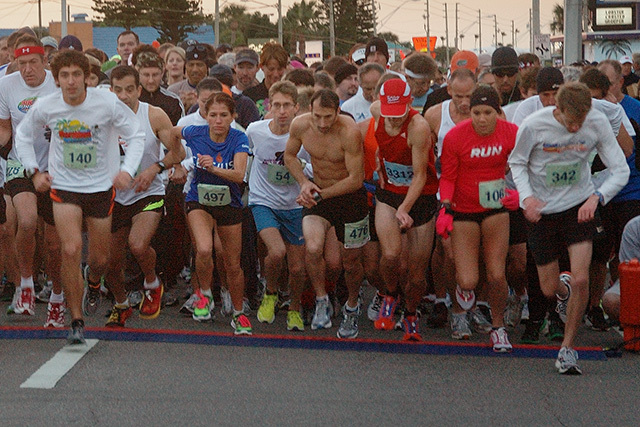 Start of the 5K, St. Pete Beach Classic. 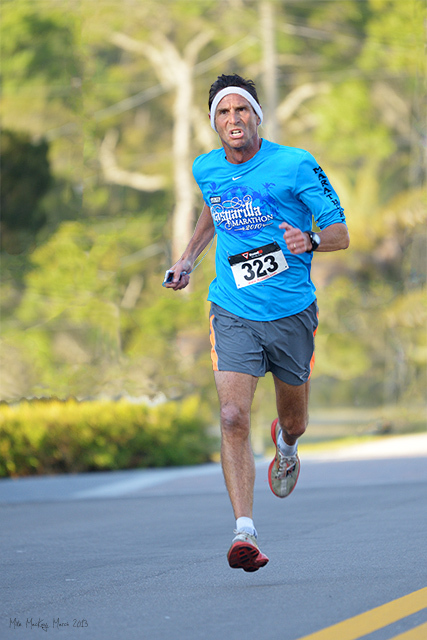 Chilly Willy Duathlon. Start of the First Wave. 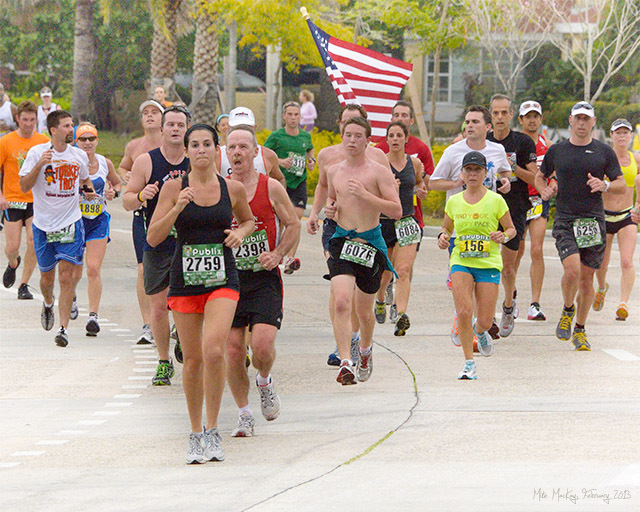 A group of runners in the Gasparilla 15k. They are at 1:10 and about 1 km from the finish. 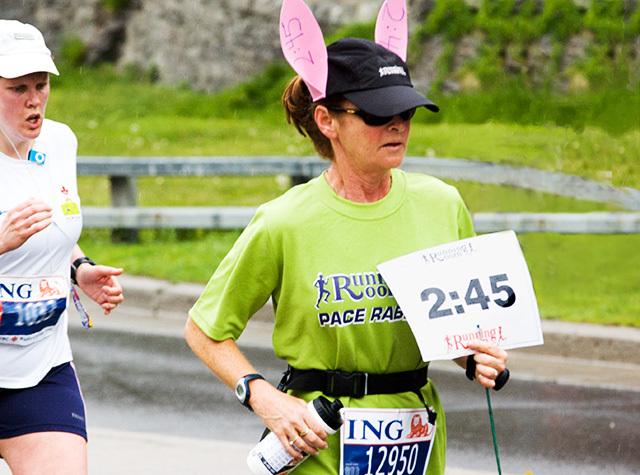 The Pace Bunny helps runners to meet their goal. The runner relies on the Bunny to move at exactly the right pace; fast enough to meet the time and slow enough to prevent burn-out. 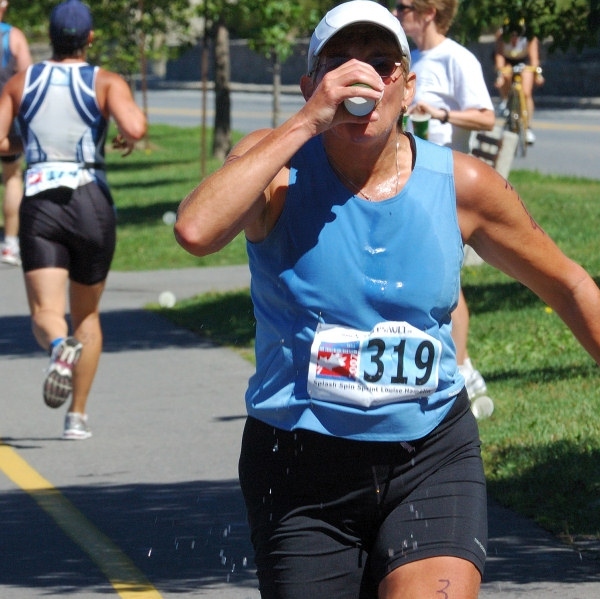 It's not totally clear in the image, but you can see the Pace Band on the water bottle. In addition, it looks from here as if there is a GPS on the left arm. 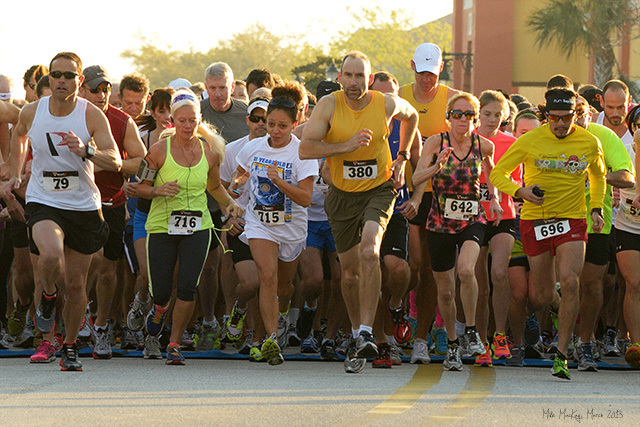 A runner in the 2013 Oldsmar Florida Armadillo 5k. The finish list does not give bib numbers, so his name isn't available. 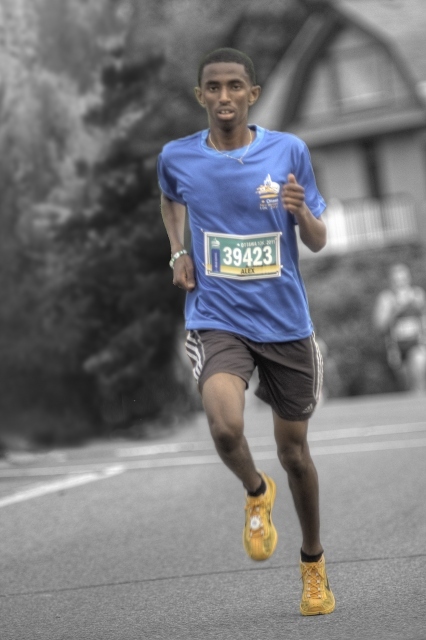 Based on the actual time the picture was taken, he finished at the 21 or 22 minute mark, which would put him around the top twenty. 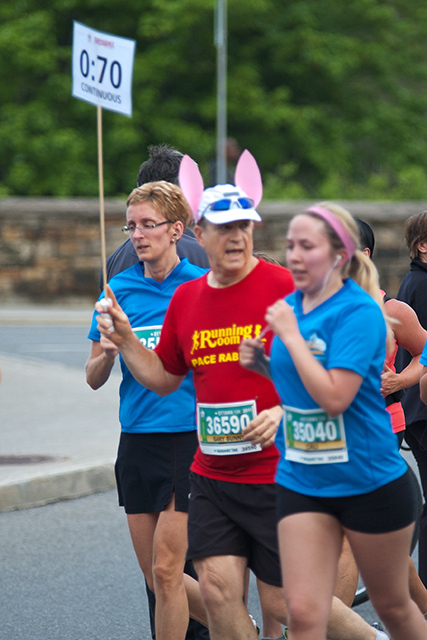 At the 9km mark in Ottawa's 9RunRun, Sandra Craig-Browne, the 1:00 hour bunny, checks to make sure she is on pace. This shot was taken at precisely 9:54. She is right on. 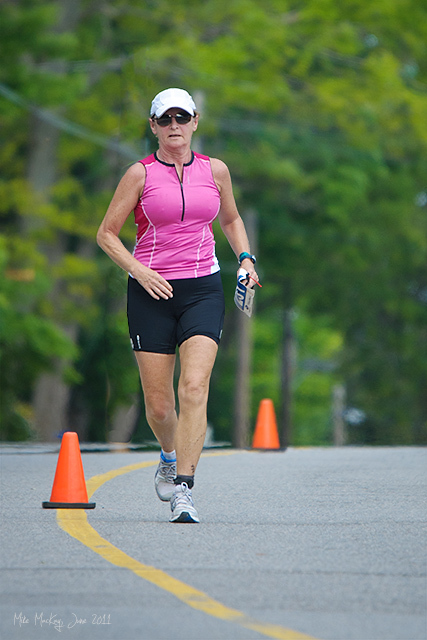 Marian on the run in the Muskoka Long Course Triathlon. 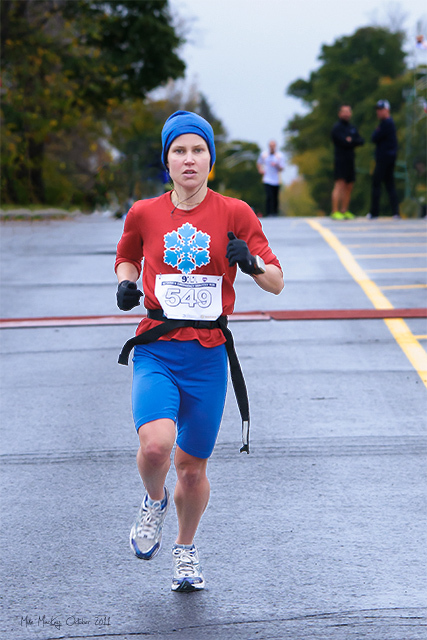 Ottawa's 9RunRun race is to support the Ottawa Police Services. 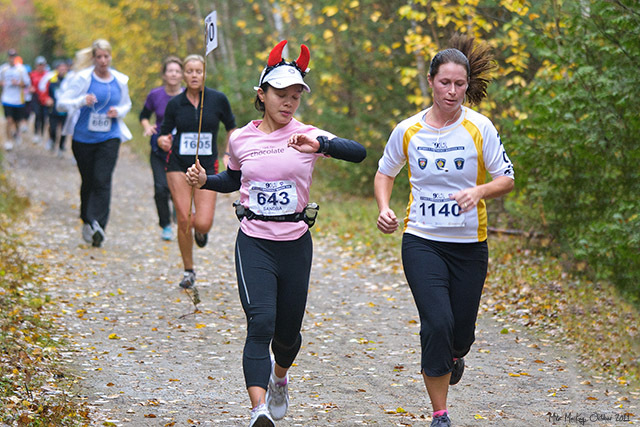 The 10k is run almost completely along the nicely wooded TransCanada Trail. 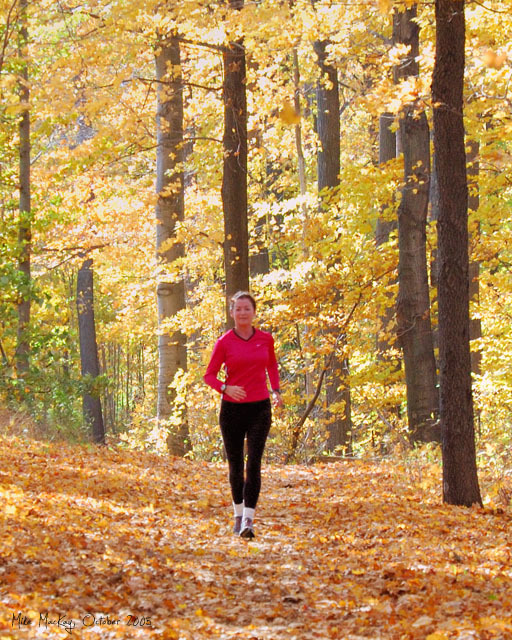 A training run on a glorious Fall day. The path is through Doreen Thompson Park in Waterloo. I took similar shots on each weekend through the Fall, but always knew that the photograph I wanted would look like this. A winter of training eventually becomes a springtime of pleasant but longer runs. 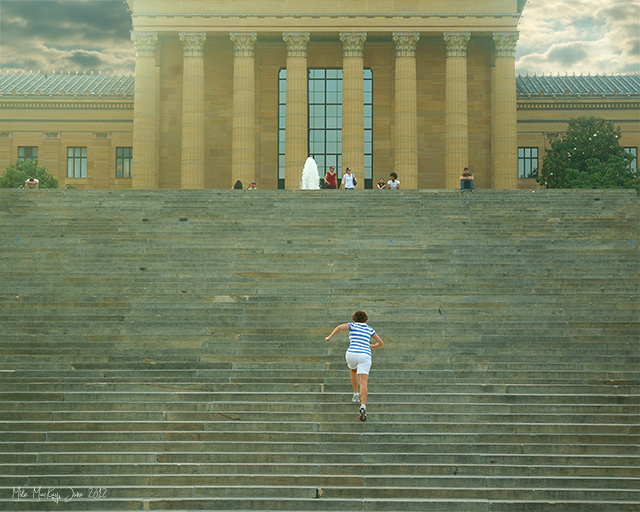 On the steps of the Philadelphia Art Museum, Marian relives the movie, Rocky. 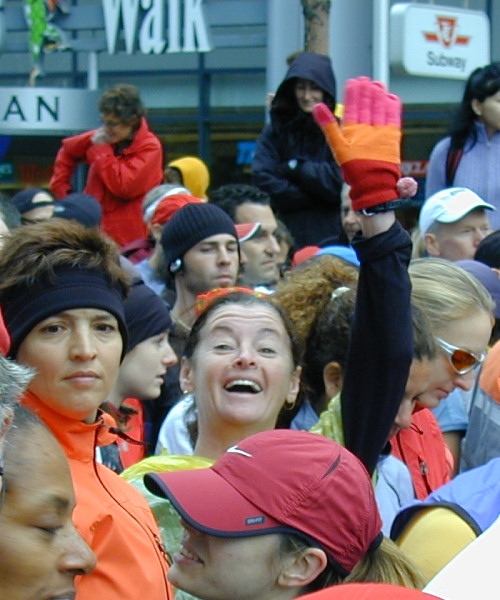 At the start of the Toronto Marathon. The gloves were fun. They were bought at the Bay the day before and were meant to be thrown away during the race. We still have them. 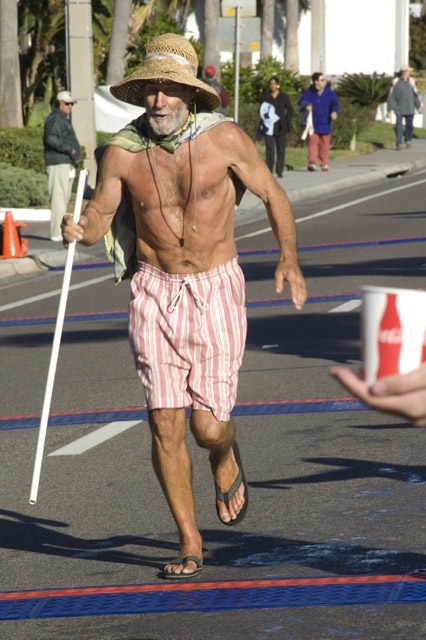 Born in 1945, the "Flip Flop Man" is a gifted runner and is well-known to runners on the Pinellas Trail. He never wears running shoes. On the Trail, he walks, mostly, but he will often fall in with runners for a distance. Age is catching up with him, but he still spends his life on the Trail. He has been known to cover fifty miles in a day. In 1990, at 45 years of age, he could run a seemingly endless number of quarter-mile sprints at a 5:00 minute/mile pace, in flip-flops. 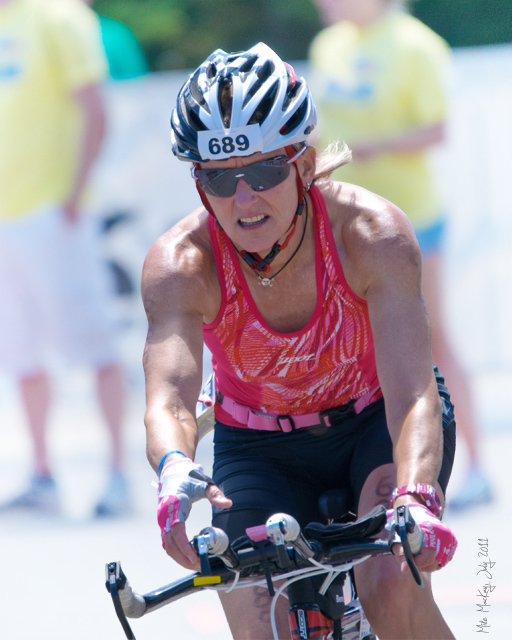 The St. Petersburg Bicycle Club organizes a water station for the bike leg of the St. Anthony Triathlon, held in St. Petersburg at the end of April each year. This is actually a fairly successful hand-off. The bottles must be uncapped for the rider to get at the contents without stopping. 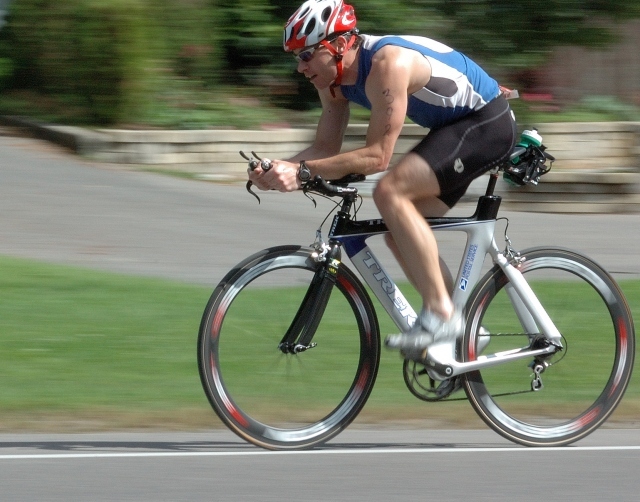 Ironman USA 2008. 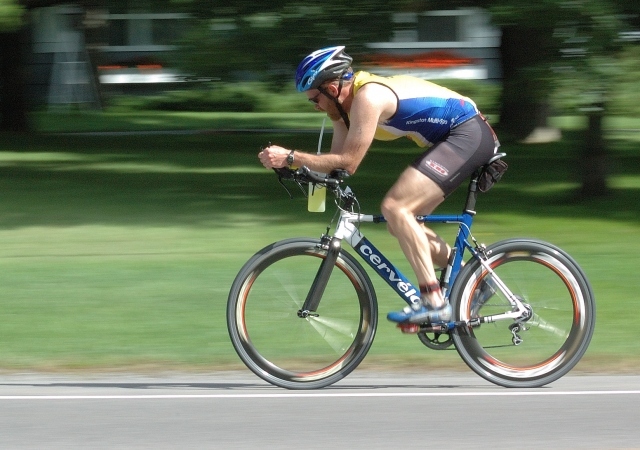 A volunteer warns cyclists about the impending turn from Mirror Lake Road onto Parkside Road. "Oh my Lord! Didn't it rain!" 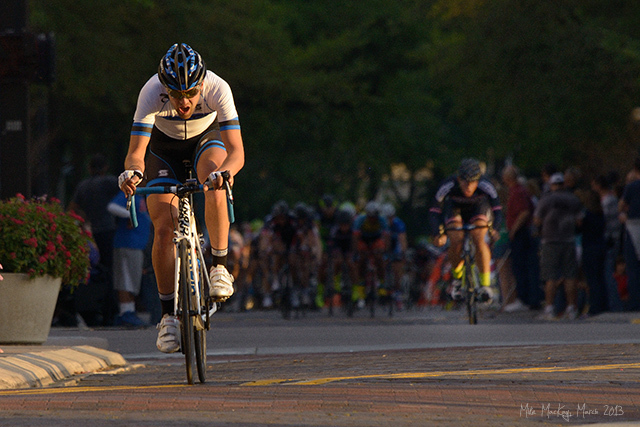 As the riders come down Mirror Lake Drive, there is a hard right turn onto Parkside Drive. 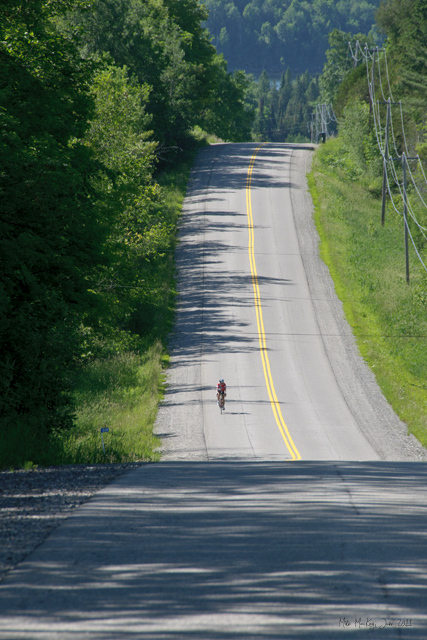 Because of the terrain and the spectators, cyclists cannot see around the corner. Here a Pointer urges caution as they approach it. This is the corner which took out Rudy Hollywood in 1999. As he came around the corner, he found himself face-to-face with a golf cart and had to hit the pavement in order not to hit the golf cart. I love this shot. 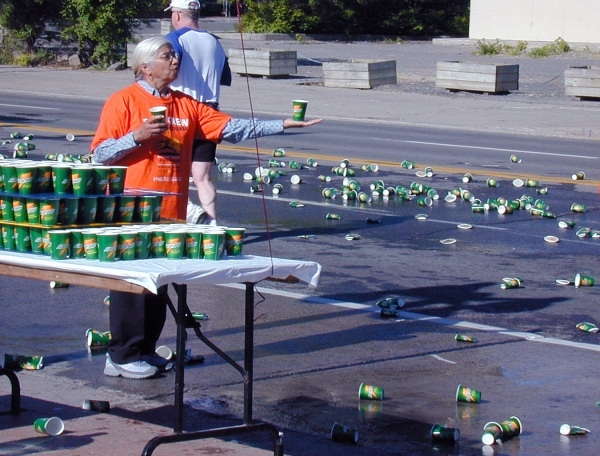 Most of the water station workers hold the cup in pendulum style; few offer the water (or Gatorade) in supplication, in the manner of this committed volunteer. 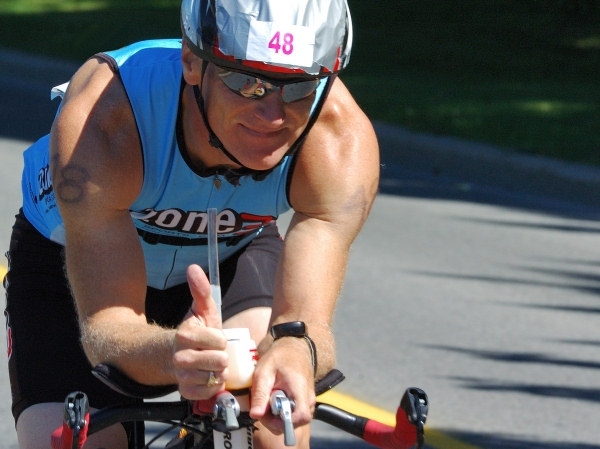 Rick Hellard approaches the Zone 3 aid station. 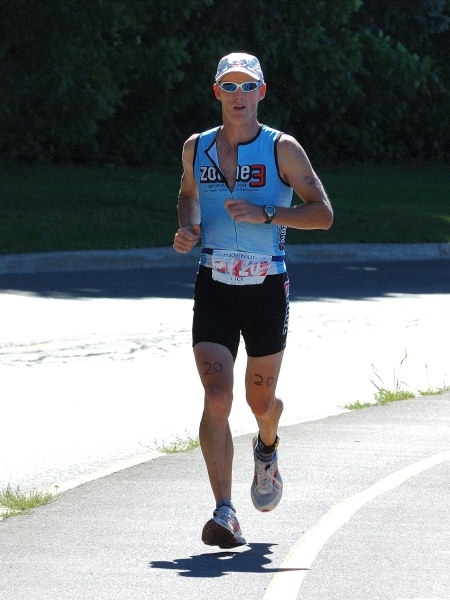 Because the run is a four loop affair, his Zone 3 athletes had eight chances to cheer him in on. 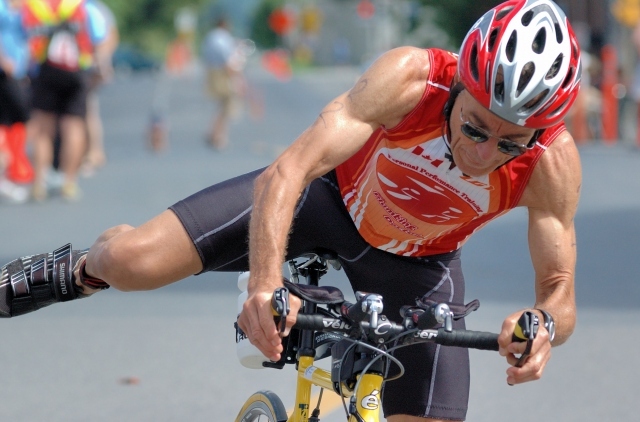 Rick shattered the course record by winning the 3.8k swim, 180k bike and 42K run in 8 hours, 57 mins and 47 seconds. It can get a little lonely out there, especially in a smaller race like Somersault's Canadian. 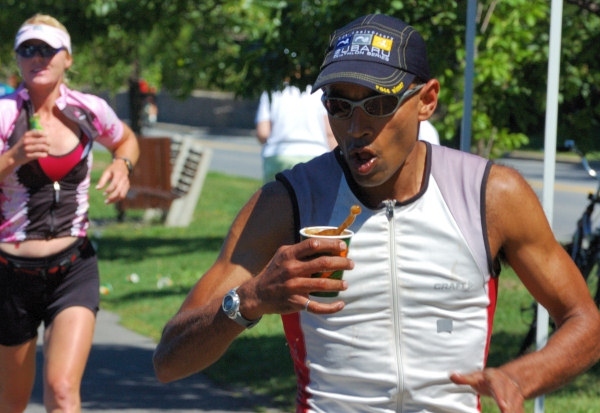 Here a New York competitor takes a walk break, but keeps going. 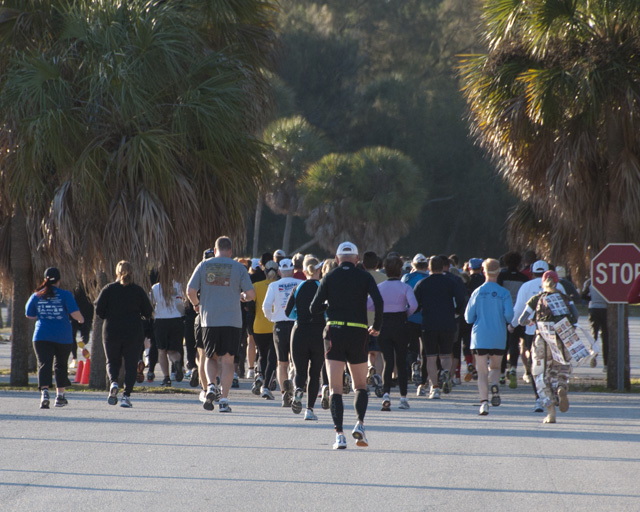 First run, Chilly Willy Duathlon, Fort DeSoto. 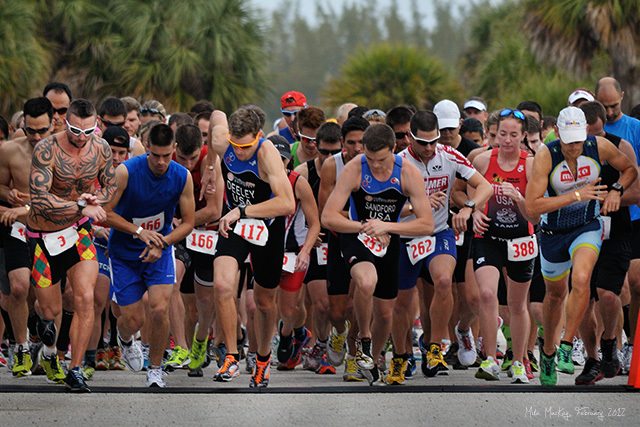 The over-39 wave leaves the start area of the 2011 Chilly Willy Duathlon and starts southward from the North Beach. I like this shot. Not sure why. 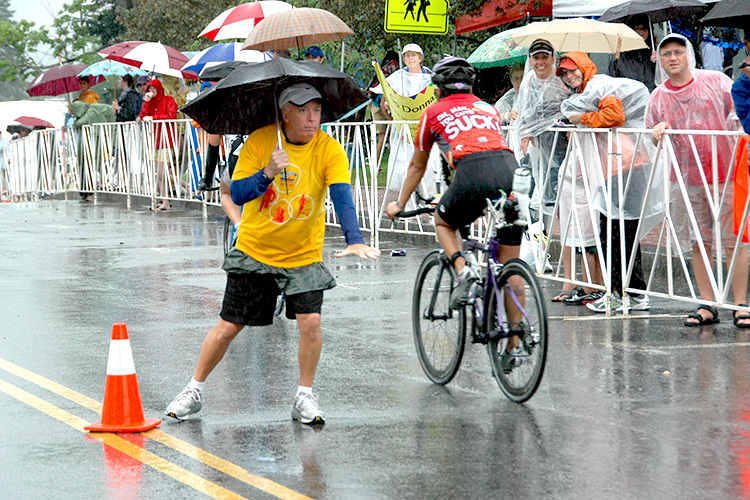 Maybe because on that particular race I was grounded with crutches. 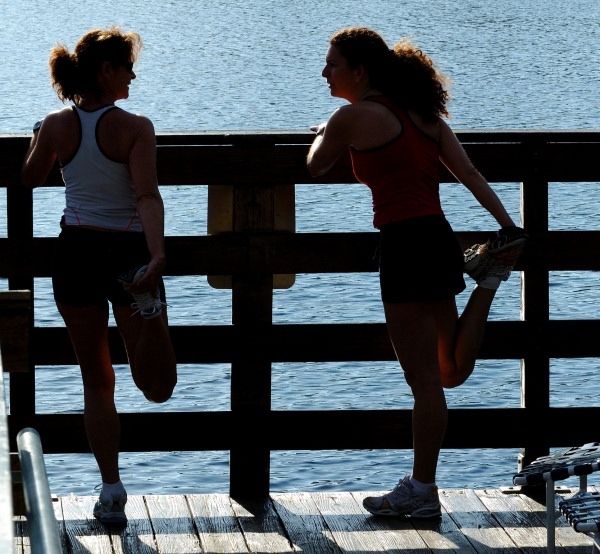 Jodi and Marian stretch after a morning run in Aventura, near Hollywood Beach. 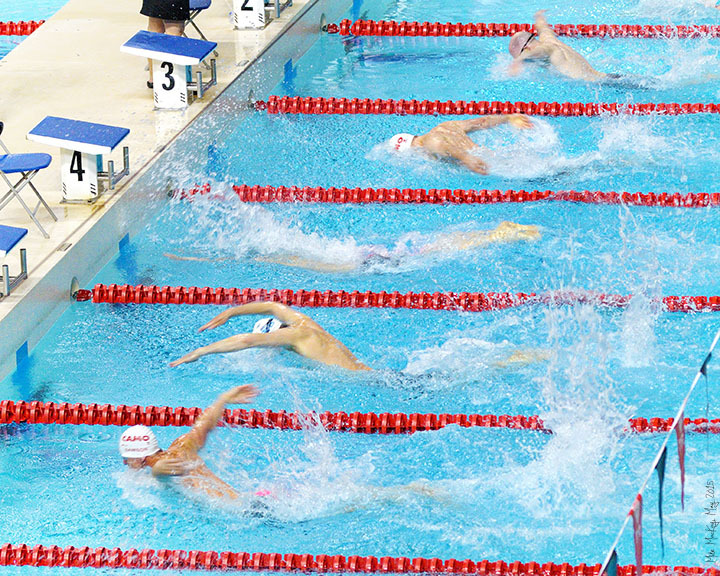 The men's 50 m butterfly. Now here is noise and excitement; a far cry from the delicate insect after which it is named.